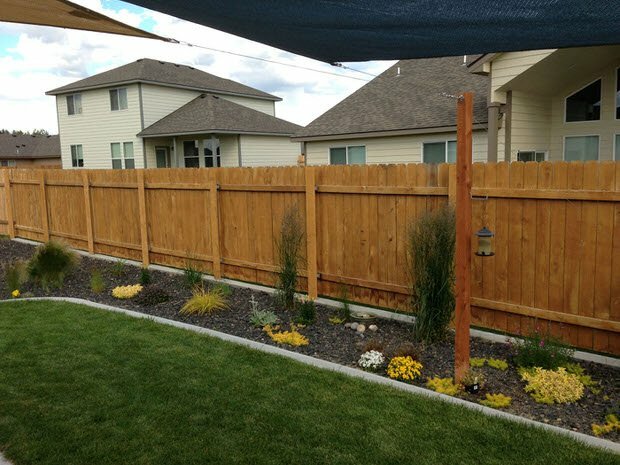 Wood fence boards, tall enough to cover to the top of your fence posts, and at least as wide. We used 5 ½ foot tall, six inch wide cedar fence boards. We are going to be creating a wire loop on the back of the wooden board, to hang over the top of the metal fence post, which will in turn cover the metal post with the wood. I suggest you read through the whole post, and check out the photos, and it will all become clear on how simple it is! Here is an example of what the wire loop will look like when finished, to help you wrap your head around what we’re up to. Hold your wood board in front of your metal post, and determine how close to the ground you would like it to hang. 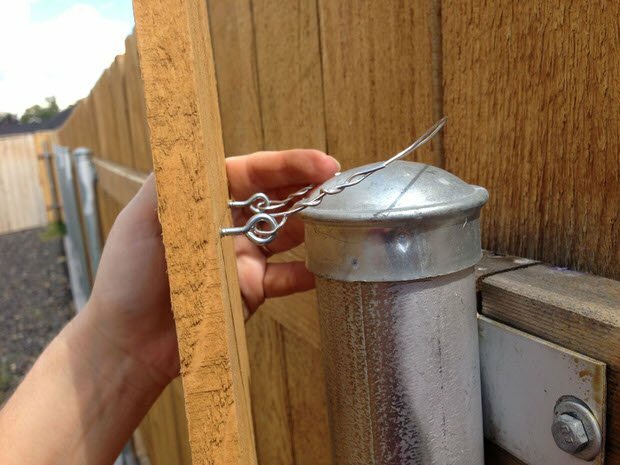 Make sure it covers the top of the ugly metal fence post. The loop will hang off of the top bracket or fence line. Measure 2 ½ inches below the spot where the wire will hang off of. Might help to have an extra hand to hold the board in place as you mark the measurements. Now lay out all you boards, and assembly line style, mark all your boards at that same measurement, and one inch in on both sides of the board. This is where you will insert the screw eyes. 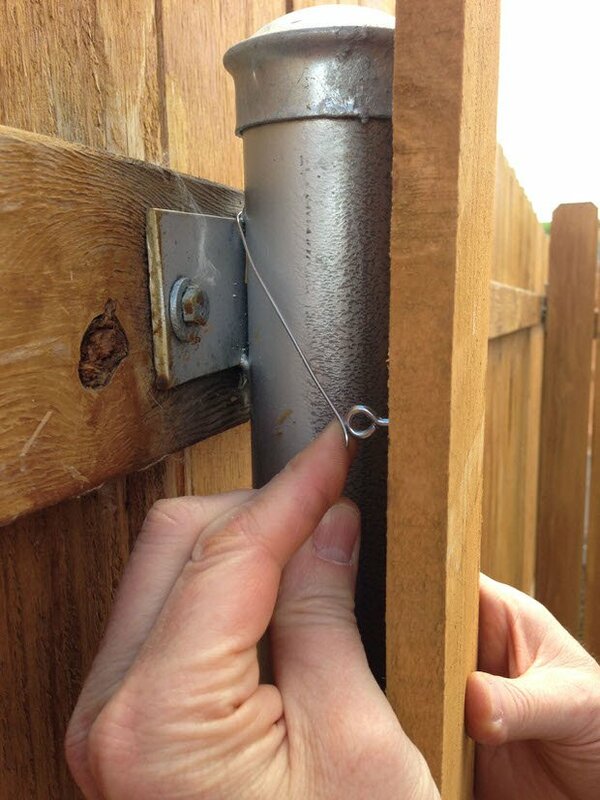 Make sure you don’t screw them so far that you poke thru the front (exposed) side of the fence board. Cut a 15 inch long piece of wire for each board. We used the wire cutter that came on the package of our wire, but you should be able to use scissors with this gauge pretty easily. 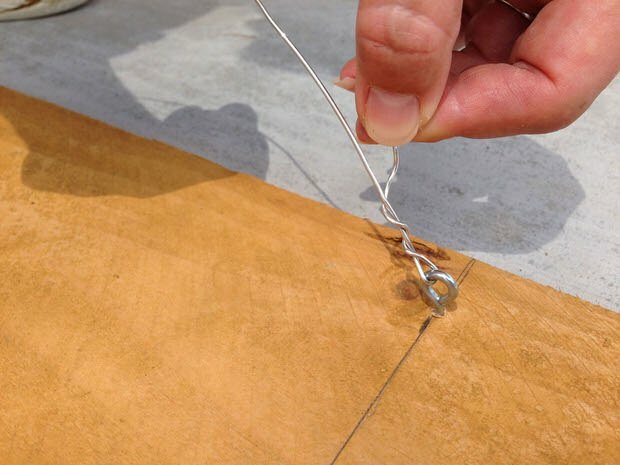 Slip through one screw hook, bend off about 1 ½ inches and wrap it tight. 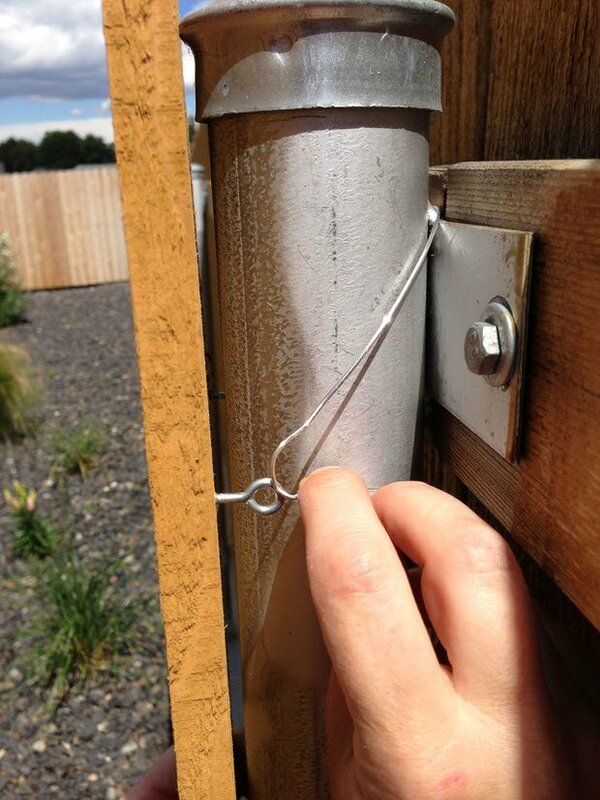 Hold the board in place, and wrap the wire around the top of the metal post and through the other screw eye. Bend to mark, then remove the board from the post. (This is to make it easier to wind the wire). Insert the free end of the wire back through the screw eye to the bend point you marked, then twist the wire closed. You now have your wire loop. 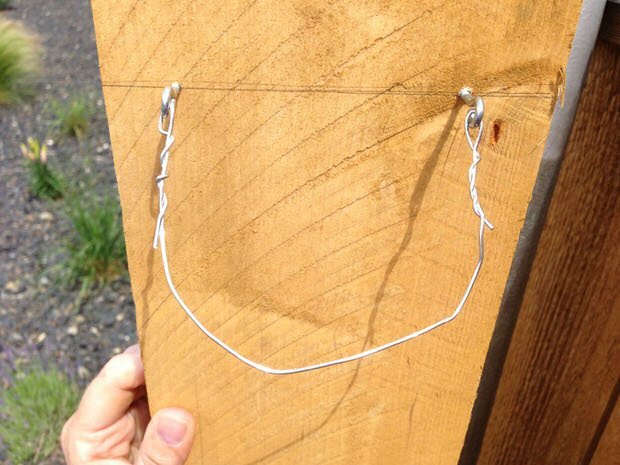 Hang the wire loop over the top of the fence post. 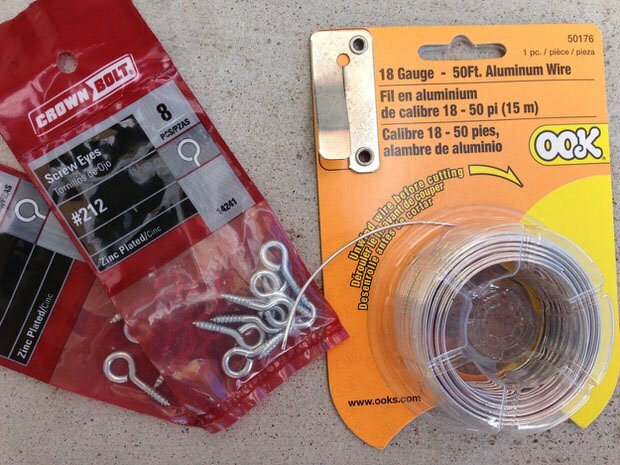 You can unwind the wire from one screw eye and tighten it or loosen it if you need to adjust. Repeat for all fence posts! If your wood boards jut too far above the top of the fence and it bothers you, feel free to trim the boards down. Just be sure to trim them all down to the same height. This likely won’t be a problem for most of us, as fence boards are pretty standard in most parts of the country. 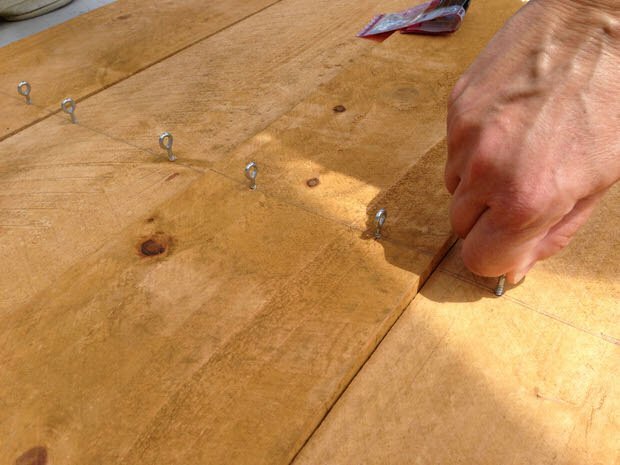 If you live in a windy or stormy area, you can repeat the process on the lower end of the board as well and secure the bottom in the same way. 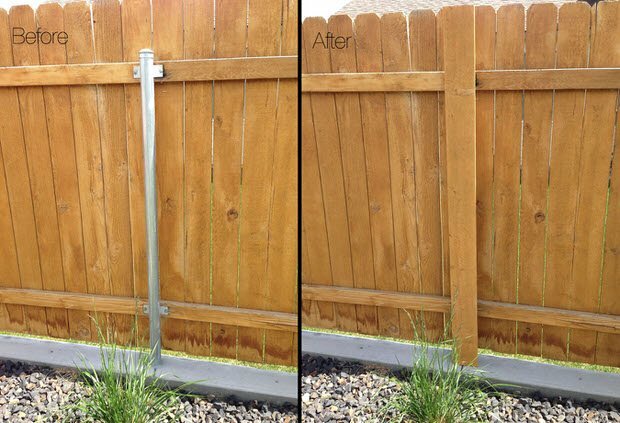 Great cure for those ugly metal fence posts, and it’s and easy and inexpensive DIY garden project. Our total? Grand total for our entire fence line, $24.00! 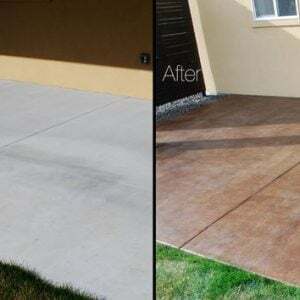 What kind of camouflage projects are you facing in your yard or garden? Comment and let us know, maybe it will be in our upcoming posts! Did you do it on all 3 sides of the posts? No, we did it only on the front facing of the post, though you definitely could do that! I actually would slightly tilt the boards on the posts farther away so they covered the metal from the patio vantage point. Hope that helps! Our neighbor had these built, but yes, they are anchored in concrete! Why bother put the posts on the neighbors side, who said spending all that cash they need to be on your side. What a great idea!!! ? Now, I’m wondering about using one of those spray paints that sticks to all surfaces??? We used green spray paint on our old deck chairs, even painting the webbing and all. Our 4 chairs are now on their 3rd. year and still look very nice. Of course you would need to put some paper or something behind the poles so you wouldn’t paint the fence too! ? Now that I have rambled on, I think I will try this paint idea. ? I’ll let you know how it works. (Of course it will still look like a pole…) ? This is a wonderful idea! We are redoing our wooden fence with steel poles set in a cement foundation to keep our dog from digging out. Yours looks wonderful, did you do it yourself? Can you tell me the dimensions of the cement foundation, depth and width? Thanks for your help! Unfortunately it was our neighbor who did the cement foundations, we just did the cover up cure with the fence boards! It does keep most grasses from growing under too! Where do you find 6″ cedar pickets at $1.70 each? Here in central Texas they are more than $3.00 each. That is cement curbing, and no, we hired that out! My husband is currently taking our chain-link poles down (just below ground level) with a grinder. It’s fast. 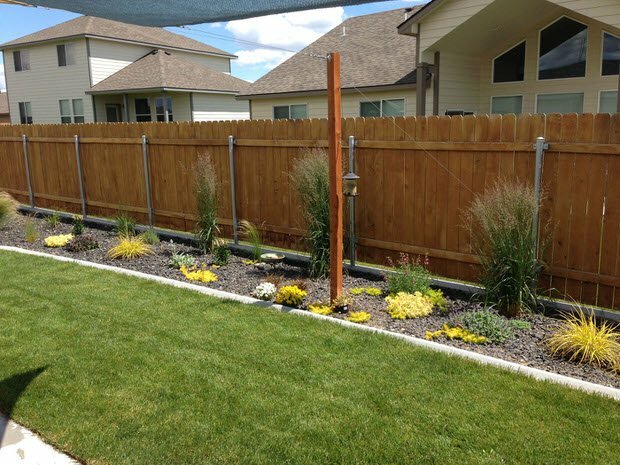 Do you find that the metal fence posts are sturdy enough for a wooden fence? We have a chain link fence and are trying to go to wood using the existing posts. Any thoughts? The view from my kitchen window is depressing, I find it hard to concentrate on my garden because of the ugly silver fence posts. Thanks for this DIY solution. I can hardly wait to try it. Seems so easy!!! OMG you are so creative…..